Lowdown: Three girls change a [formerly] evil person plotting to steal the moon. By now I’m as sick as anyone with computer animated movies. Alas, I have to watch many of them by virtue of also happening to be a parent and them being the main movie fodder my son feeds on. Perhaps this attitude of mine explains why I was rather pleasantly surprised by Despicable Me. Or maybe it’s just original enough and well made. Our story starts with the discovery that one of Egypt’s pyramids has been stolen, replaced by an inflatable one. How come no one saw it happening? Obviously, this has to be the work of the world’s biggest criminal. As it turns out, our hero for the duration of the film, Gru (Steve Carell) is not that guy. He sure is a criminal, though, with his authentic rare animal based home furnishing (the panda bear throw rug is the Pièce de résistance). However, Gru like an upgraded status. He wants to be the biggest criminal in the world! He comes up with a plan: steal the moon. In order to implement his plan he requires a special miniature-ing ray gun, but as he sets to get it he finds himself overtaken again by another criminal, the nerdy and stupid looking Vector (Jason Segal). What can Gru do to get the gun from Vector? Perhaps he needs three little girls that can sell Vector cookies and divert his attention while Gru steals the gun? A fine plan, only that in the process our Gru finds there are more important things than being a criminal with one's own personal agenda. Things like being a parent. 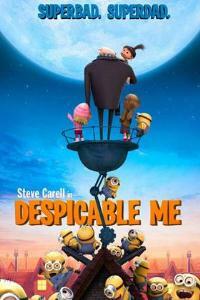 Despicable Me thus turns out to be a computer animation movie with plenty of adult appeal. There are your basic jokes aimed squarely at adults, like Gru paying the Bank of Evil (formerly Lehman Brothers) a visit to get a loan with which to finance his evil aspirations. But there's more. Despicable Me has plenty to say that every parent would find interesting and authentically touching: it discusses the demands of parenthood and the toll those demands take on the parents, and it also gives us a view from the other side – how the parent is perceived by the child. It does so through several angles, which generates a genuinely good cinematic tale. In other words, this is not your average computer animation film. Which is all a parent to a child hungry for such content could ask for. Overall: Surprisingly good at 3.5 out of 5 stars. We are [almost] looking forward to the sequel.